Theatre Scene in Delhi is getting better day by day. There are many theatre festivals which are organized every year like Bharat Rang Mahotsav by NSD, Mahindra Excellence in Theatre Awards, Prithvi Theatre Festival, Puppet Theatre Festival & more. Plays are organized by students of National School of Drama (one of the foremost theatre institute in delhi ) on a regular basis. Shri Ram Centre, The Little Theatre Group, India habitat Centre, Epicentre ( Gurgaon ), The Little Theatre Group are other such places with lots of theatre activities. 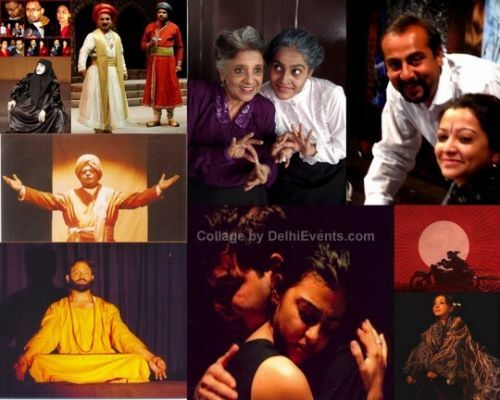 Theatre groups which are active in delhi includes Asmita Theatre Group, Pierrot's Troupe, Natsamrat, TheatrePlayers, Mask Theatre Group, Atelier Theatre Society & many more. Urdu Academy, Punjabi Academy, Hindi Academy & other such academies also organize plays. Many more plays by Individual directors and foreign productions also happens in delhi. English, Hindi, Urdu plays are prominent. There are plays in other languages too like Punjabi, Sindhi & other such regional languages of India. check the links given above! wonderful site. Its almost as if I was back in Delhi to watch the oerforming art scene. I am glad I could gather so much information on this site. I would like to visit the site again and again in future also.